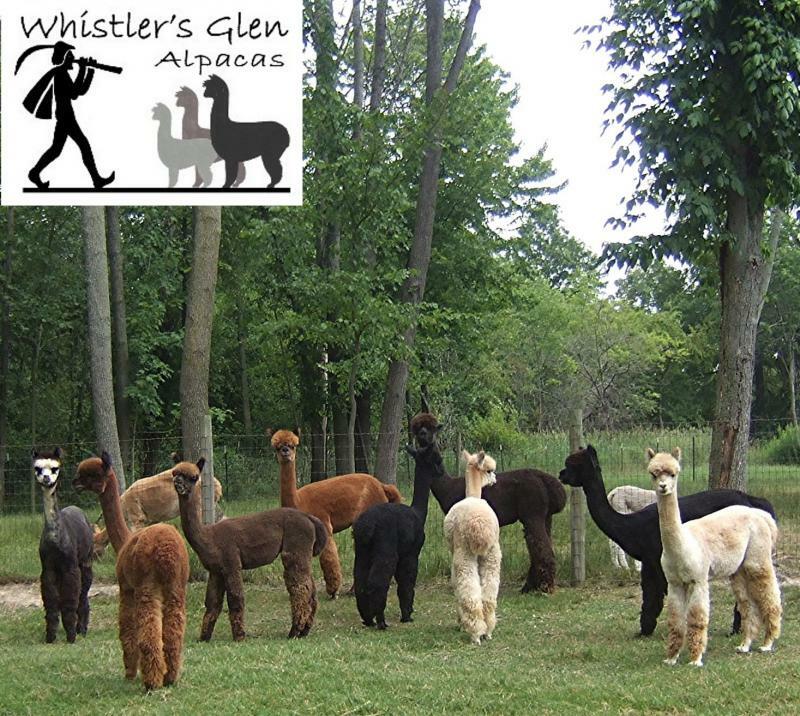 alpacaEstore - About Us We breed and birth our own alpacas.......shear their luscious fiber........process it into rovings and yarn......and then produce handmade finished products. Our fiber harvest takes place between April and May each year and becomes the foundation of our end product adventures. In addition to our farm duties, we attend fairs and festivals throughout the year to promote our end products and to educate the public about the unique and special qualities of alpacas and their fleece. Kathy Arnold is the owner of Whistler's Glen Alpacas, in Hudson, Ohio. The farm is conveniently located between Cleveland and Akron just off the turnpike and other major highways.Our products are always available at Long Tail Knits in Macedonia, Ohio, which is a short distance from the farm. The store address is shown at the top of this page. Most of our classes are conducted at Long Tail Knits, and Kathy teaches spinning, weaving, and felting at beginning as well as advanced levels. Our class list is available on our Workshop and Learning Opportunity page as well as on the www.longtailknits.com website.Our no-fear, confdence building dye workshops are held weather-permitting, at the farm during the warm months of the year so watch the schedule for dates to be added.We also welcome inquiries regarding participation and workshops with groups and guilds.From raw materials, to fiber prepared for spinning and weaving, to yarns, and finished oiginal design fashion accessories, and teaching spinning, weaving, felting, and dyeing........... we hope you will join us for fun and learning ! Devoted to the promotion of the amazing properties of alpaca fiber and its products, in combination with the beauty and variety of longwool sheep breeds and the silky drape of mohair. We breed and birth our own alpacas.......shear their luscious fiber........process it into rovings and yarn......and then produce handmade finished products. Our fiber harvest takes place between April and May each year and becomes the foundation of our end product adventures. In addition to our farm duties, we attend fairs and festivals throughout the year to promote our end products and to educate the public about the unique and special qualities of alpacas and their fleece. Kathy Arnold is the owner of Whistler's Glen Alpacas, in Hudson, Ohio. The farm is conveniently located between Cleveland and Akron just off the turnpike and other major highways. Our products are always available at Long Tail Knits in Macedonia, Ohio, which is a short distance from the farm. The store address is shown at the top of this page. Most of our classes are conducted at Long Tail Knits, and Kathy teaches spinning, weaving, and felting at beginning as well as advanced levels. Our class list is available on our Workshop and Learning Opportunity page as well as on the www.longtailknits.com website. Our no-fear, confdence building dye workshops are held weather-permitting, at the farm during the warm months of the year so watch the schedule for dates to be added. We also welcome inquiries regarding participation and workshops with groups and guilds. From raw materials, to fiber prepared for spinning and weaving, to yarns, and finished oiginal design fashion accessories, and teaching spinning, weaving, felting, and dyeing........... we hope you will join us for fun and learning ! Our Hudson farm is home to the producers of our beautiful fiber. In a world that has become so hectic, we invite you to visit and enjoy the tranquility of the farm. Watch the babies (cria) play and interact with their moms. Copyright 2009 alpacaestore. All rights reserved.